Migrants wait to be rescued from a rubber dinghy by members of the Spanish non-governmental organization Proactiva Open Arms during an operation on the Mediterranean Sea last September. More than 3,100 migrants died making the trip in 2017, but the IOM notes the number of fatalities is likely higher due to the number of boats that sink without rescue crews knowing. Last year, more than 5,000 people died along the sea route. "People are still dying at sea in enormous numbers, even after years of seeing this happen repeatedly," Eugenio Ambrosi, IOM regional director for the European Union, Norway and Switzerland, said in November. "We have to ask ourselves, why is this still happening?" 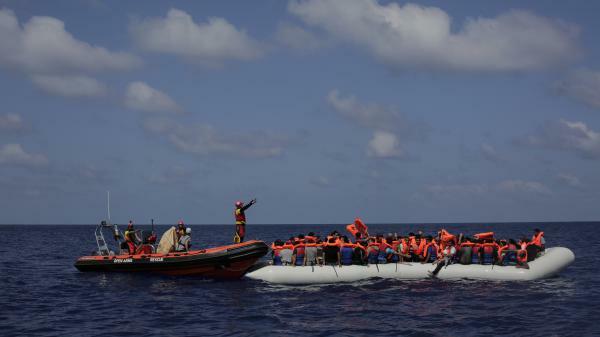 The Libyan Navy said on Saturday at least 25 migrants drowned off the country's coast after their boat capsized in international waters, the Associated Press reports. In a separate incident, the Italian coast guard on Saturday recovered the bodies of eight migrants and rescued 84 others from a smugglers' boat off the Libyan coast. The AP reports the migrants were in the water for hours before being saved and dozens could still be missing. The death toll continues to rise even though the number of migrants crossing the sea has significantly decreased. The number of arrivals has sharply dropped since the European Union reached a deal with Turkey in March 2016 to close a main route along the Eastern Mediterranean into Greece. The IOM reported on Friday that 171,635 migrants and refugees entered Europe by sea in 2017, down from 363,504 arrivals last year. The majority of those migrants arrived in Italy, followed by Greece, Spain and Cyprus. "Rescue at sea needs to be more robust and well resourced, with a clear, life-saving mandate and better cooperation among all actors involved," Ambrosi said. "But at the same time, the best way to save lives is to offer migrants a way around smugglers through safe and legal bridges to Europe." As NPR has previously reported, many of the victims have died in mass drownings after smugglers force hundreds of people into delicate dinghy-style small boats. Since the collapse of Col. Moammar Gadhafi's government in 2011, Libya has become the main transit point for migrants seeking to reach Europe by sea. According to Amnesty International, European governments have also been complicit in the abuse of refugees in Libyan detention centers, as they work to reduce the number of migrants arriving from the North African country. Many North African migrants who try to reach Europe by boat are often intercepted by the Libyan coast guard and handed over to criminal gangs that traffic them. Nearly 20,000 people are detained in Libya, Amnesty says. "European governments have [implemented] migration-control policies that, by reinforcing the capacity and commitment of Libyan authorities to stop sea crossings, are trapping thousands of women, men, and children in a country where they are systematically exposed to abuse and where they have little chance to seek and obtain protection," according to a December report by the human rights group.